The Yorkshire Educational & Social Weekend (YESW or the ‘Scarborough Weekend’ made its debut in 1975, costing the princely sum of £13.50 per head. Started by a group of like-minded funeral directors in the Yorkshire area to promote education and fellowship, it swiftly became popular and was led by Arthur Hey (Bradford), Norman Hickling (Doncaster, Basil Walsh (Bradford) and Len Waite (Leeds) in the early days. All these have sadly passed away, but other characters involved since have included Brian Thornton (Silsden), Alf Bollons (Thorne) and Paul Owram (Sheffield), followed in 1991 by Andrew Waite, Richard Binks and Alastair Huteson, later succeeded by Alison Turnbull (nee Waite) and Clive Kirk. Last month’s event – the 38th – saw the initiative go out on a high with 50 hardy souls making their way to the East Coast. Raffles and charity auctions over the last 10 years have raised more than £12,000 for good causes, and this year was no exception with a cheque for £1000 presented to Andrew Lever of Bradford for Cancer Research UK, in memory of his late father George. He was a staunch supporter of the event who brought his family with him to Scarborough each year. The Friday night dinner was this year followed by entertainment from singer and entertainer (by night) Ross Cole, who works for Co-operative Funeralcare in Scarborough by day. The weekend was officially opened on Saturday by Yorkshire Area Federation President Danny Doherty, and the day included two education sessions: an in-depth look at ‘The positives and negatives of electric funeral vehicles’ by Eddie Marsden from Coleman Milne – prompting lots of questions on insurance, government involvement and charging points – and a seminar presented by Richard Venables QPM, entitled ‘The disaster detective’. 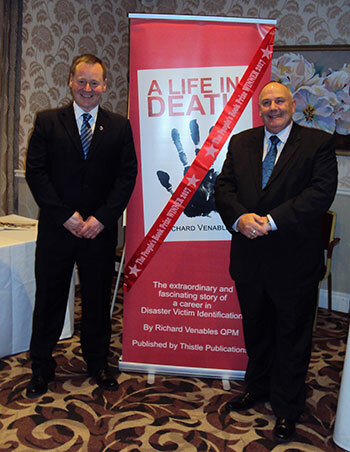 Richard started as a young police officer in the South Yorkshire force, and ended up Detective Inspector, specialising in the recovery and identification of the deceased in mass disasters and emergency mortuary management, receiving the Queen’s Police Medal. On retirement he became a writer and won the People’s Book Prize in 2017 for ‘A Life In Death’, based on the story of his work. Sunday morning saw the final educational session with author Dr Gervase Phinn, who entertained delegates with an informative and humorous insight into his life as a schools inspector. Alastair Huteson thanked all exhibitors, sponsors and delegates for their support over the years, and the common opening words of the late Len Waite “the sun is shining, the donkeys are on the beach, let’s enjoy the weekend” were fondly recalled. While the sad decision had been taken to call an end to the event, it would be long remembered in the funeral world.